We are in serious, up to your ears, wedding mode here. This mother is seriously BUSY! My calendar is overflowing, my checkbook, not so much. Not sure what I've divulged on here, but, Jessica is getting married Aug. 11 and Scarlett is getting married Jan. 19. Jessica's wedding is a small ceremony, with a cocktail party following, at our house. Ah, yeah... here.. in Victorian Hell. Victorian Hell, that I look around and think, really? I need to do a little redecorating, actually, maybe I need to do a LOT of redecorating. Ugh. ....Corbin.... are you reading this??? Scarlett being Scarlett, is having her wedding in a repurposed warehouse in downtown Chicago. EVERYTHING has to be brought in. By everything, I mean EVERYTHING from the forks to the tables, to the staff. Originally, I thought, I'd plan this, what else do I have to do? Right? Wrong. I hired a wedding planner. We've met with her a couple times already, and I think she's going to be great. Monday, we checked out the venue, and gave her an overview of the 'look' Scarlett had in mind. We got a feel for some placement and I came away feeling that this can be done and will be awesome. Honestly, I am happy to dump some of this stuff in her lap and let her worry about the forks.... etc, so I can worry about the important things.. like what the hell I'm going to wear and how to convince Mark to spring for a little nip/tuck. Not happening...suffice to say, you'll just have to wait! It's been a very expensive couple of weeks, and I have a feeling it's just beginning. Now, seriously when you have a daughter, it's not just about the hair bows, ruffly pants and dolls ... you've got to factor in the dresses, from the little smocked ones with matching bloomers to the prom dress (a zillion times) and the big finale... the wedding. There is nothing reasonable about a wedding dress... but what the hell, why not say 'YES TO THE DRESS'!?! I'll leave you with a picture from my kitchen window. 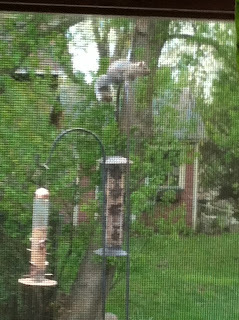 We've got a squirrel that's just a little pushy as well as being a window peeker. He's out there looking at me way too much.....just a little creepy I tell you. Only you would have a squirrel as a creeper!!!! Nip/tuck really? WHere???? ummm...your big toe???? YAH!!! for the dresses!!!! !